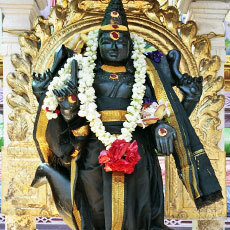 Saneeswarar (Saturn) is one of the nine planetary deities known as the Navagrahas. Saneeswara, also known as Manila* is generally known to affect one adversely on occasions when he occupies certain positions in one's horoscope like Saadc Sail (7 '/, years) Ashtama vSani (Saturn in 8th house – 2 years) etc. He was bom as the son of Saya Devi and Surya, the Sun. He is known to cause poverty, chaos and sickness. A prayer to Saneeswarar, especially on Saturdays, is said to mitigate the hardships one will have to face during these periods. Similarly in an auspicious place Saneeswarar is also known to give limitless benefits. He is black in colour and has a crow as his mount. He is the Lord of Makaram and Kumbam. He is the slowest moving planet taking 2 72 years in each Rasi, completing one cycle every 30 years. This is also attributed to the fact that he is disabled and thus is only able to move slowly.